It is a sweet gift from the Lord that this particular passage is the one that we are going to study together on Graduation Sunday. We just sang the key verse in our last song (v.33), one of the most famous verses in the Gospel of Matthew, and our brand new Hide the Word verse for this Summer. What a perfect passage to give as a gift to our grads! Grads, I hope this message speaks especially to you as you launch into this new exciting season of your life. But of course Jesus didn’t just give that verse to the grads. He gave it to all of His disciples and to all of us here. And He didn’t just give it as a verse all by itself. I mean you can tell just by the word it starts with, “but.” There’s an argument going on here. And it references “all these things” but doesn’t say what all these things are. We have to study this verse in its context to really get its message. The context is Jesus’ Sermon on the Mount. The first of five major blocks of teaching from our Lord in the Gospel of Matthew. Jesus has gone up on a mountainside and has begun to teach authoritatively. He is teaching as the King, the Messiah Who was to come. The fulfillment of all of the Promises of the Old Testament. And the fulfiller of all of the Law of the Old Testament, too. In His Sermon on the Mount, King Jesus is telling His disciples how to live as citizens of His kingdom which has come and is to come. And we’ve said that this kingdom is an upside-down and an inside-out kingdom. That is, everything in this kingdom seems upside-down. But it’s really us. So we need to change to fit in. We need to repent because the kingdom is near. And we need to change from the heart. It’s not good enough to look good on the outside; Jesus wants us to change from the inside-out. To have a righteousness that is whole, complete, perfect...from the heart out to our behavior. Not like the scribes and the Pharisees! They were just outside-guys. Our righteousness needs to be greater than their’s. Our needs to be whole-hearted, from the inside-out. And where we left off last week, Jesus was saying that our hearts need to be wholly His when it comes to money and possessions. Jesus warned us to choose wisely between two paths, between two masters. I only have two simple points to make this morning to try to capture the application of this passage. Neither one should surprise you, they are right there in the text. But both of them are BIG, no matter how simple they are. #1. DO NOT WORRY ABOUT YOUR LIFE. I don’t know about you, but I need this one badly. Left to my own devices, I am a worrier. It’s one of my besetting temptations. My wife tells me that she remembers copying out this particular passage of Scripture and giving it to me on a piece of paper in the first year that we knew each other. Long before we were married. Long before we were engaged. When we were about your age, Grads. When we were just barely dating, Heather could already see that I had a major problem with worrying. And she said, “Here. Read this. You need this.” Matthew chapter 6, verses 25-34. Three times in this passage, Jesus tells His disciples to not worry. Verse 25, verse 31, and verse 34. You think He means it? Now, Jesus is not saying that we shouldn’t think ahead or plan for the future. The graduates are right to be making plans for what’s next for them. We saw last week that the Proverbs commend the prudent who look into the future and make appropriate preparations. I also don’t think that Jesus is prohibiting us from being concerned about things. We are called to care about certain things and deeply. To care how they turn out. To care about others and their futures. The Apostle Paul talks about his concern for the churches. And how perplexed he was at times for them. He talked about it being like giving birth! It’s right to be concerned and even heavily perplexed at times about things. Do not get carried away with worry. Do not give in to anxiousness about your life and your future. And that extends down to the basic details of life. Jesus uses questions to prod our hearts. Is life more important than food, and the body more important than clothes? I think the point is that God has given us life and that’s a big thing. Don’t you think that He can do the small thing of giving you food? If God has given you a body, that’s a big thing. Don’t you think that He can provide something to keep you warm and modest? The point is that God cares. Are you more valuable than a bird? We are so used to those words, but they are mindblowing! Those words change everything, don’t they? If God is your Father, then what? Now, notice that Jesus is not saying that we shouldn’t work. Do birds work? Of course they do. They spend all day looking for food. This is a not a call to laziness. Because you are more valuable than the birds. Listen to this question. Verse 27. Well, I totally act like I can! If I just worry, then at least I’m...what?...doing something. But Jesus says that worry is worthless. You just about might be able to do the opposite. Take some hours off your life by worrying. But worrying does not accomplish anything. Now, that’s one of the ways you can tell if you are caught in sinful worry. Sinful worry is not productive. Being properly concerned and engaged can be productive. Worry is counterproductive. Worry is foolish. There is no point to it. Here’s another question from Jesus. Verse 28. Yes, of course, He will. Because God is your Heavenly Father. My wife loves flowers. She would spend all day every day in a flower garden if she could. And she’s seen some beautiful ones. Last year, she got to go to Monet’s Garden in France. There is so much beauty in God’s world. If God does that just for nature that is here today and then gone tomorrow, what will He do for His children? Do you see what Jesus called us? And Jesus calls His disciples that 4 times in the Gospel of Matthew. It’s one of His favorite names for us! It’s a gentle rebuke name. My wife has a similar term of endearment for me and my three sons. When we’re just not thinking. When we’ve forgotten what we know. She never says it in anger. She says it to give us a gentle shove back to where we belong. That’s what Jesus is doing. He’s giving us a gentle shove to remind us to not give in to worry. The opposite of anxiousness is faith. Do you see the rebuke? The pagans do that. They “run after” all of this stuff. But they don’t have God. Yes, the pagans get consumed by stuff. By money and possessions. They store it up stuff in the first of bank of Earth. Because that’s the only bank they know! That’s the only bank they can see. That’s the only bank they believe in. But we know about the First Bank of Heaven. And we know God the Father! And God the Father knows what we need. They have no god. What’s your excuse? Yes, it’s a rebuke. But it’s also a reassurance. Don’t just hear the rebuke. Hear the reassurance. “So do not worry, saying, 'What shall we eat?' or 'What shall we drink?' or 'What shall we wear?' For the pagans run after all these things [they seek them, strenuously], and your heavenly Father knows that you need them.” v.33. #2. 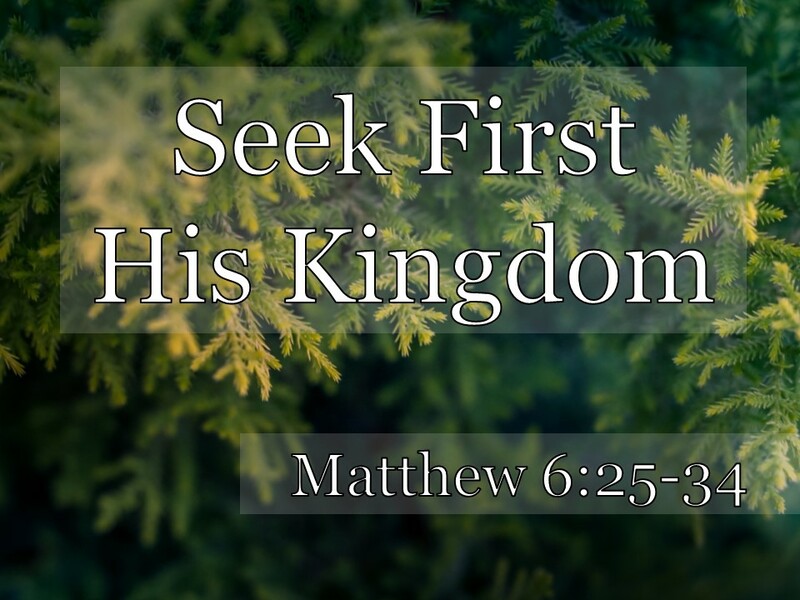 SEEK FIRST HIS KINGDOM. That’s the antidote to worry. To put the kingdom first. And amazingly, “all these things” will be gifted to you, too. “All these things” must be the food and drink and clothes that the disciples need. They come almost as an afterthought for what’s really important. The word “seek” is the same root word as the “run after” in verse 32. It means to really strive for something. To find something, to search it out, to make it a priority. Jesus wants us to run after the kingdom. To make the kingdom our first priority. So that every other priority seems really far down the list. This is the opposite of what the world will tell you. When my wife graduated from high school, the speaker at her graduation ceremony talked about the vital importance of making money. Heather’s impression was that what he had to say was that Money was the most important thing in life. And so making money was the most important thing for you to do with your life. Money opens so many doors and does so much for you. Now, most people are not that crass. They don’t come out and say it that way. This guy was at least honest. But isn’t that message of so many in this life? And for those who don’t, it’s something else. It’s happiness. Or popularity. Or the absence of conflict. Or pleasure. Make that your number one priority. And all of the other priorities will fall into place. Don’t miss that phrase. Jesus has been talking about talking about righteousness for the whole Sermon on the Mount, hasn’t He? He wants us to hunger and thirst for righteousness, and we’ll be filled. He wants us to live out a greater righteousness than the scribes and the Pharisees. Then we’ll be great in the Kingdom of Heaven. He wants us to practice our righteousness in secret, for the approval of God alone, and then our Father who sees what is done in secret will rewards us. He wants us to go whole hog after righteousness, and then we’ll get all these things as well. He simply saying that He wants us to live the way He’s been laying out in the Sermon on the Mount and not worry about anything else. Now, there will be times when Christians go without food or clothing. There will be times when Christians are deprived of those things in the short run. The Apostle Paul was at times. This is not saying that food and clothes will miraculously drop out of the sky every single time you need them. But those times when Christians are deprived are few and far between, and they will all be more than made up for when the kingdom comes in all of its fullness. Just worry about the kingdom. 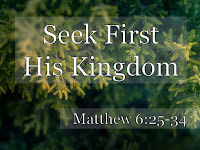 Just seek first His kingdom and His righteousness. Whose kingdom is Jesus talking about in verse 33? What is the antecedent for “his” in verse 33? It’s “your heavenly Father” from verse 32, isn’t it? This kingdom belongs to your Dad! Let the future worry about the future. Most of the stuff you worry about never comes true. Just deal with the problems you’ve got in front of you. Don’t make any more for yourself. I know that there is a line here that’s sometimes hard to discern. What is worry and what is appropriate concern? I don’t know about you though, but I never run that line. I’m always over on the rumble strips. I’m always over there worrying about my little kingdom. And Jesus is calling me, and I’m sure He’s calling you to cut it out. To repent of sinful worry. To turn away from building my little kingdom and serving Mammon. To repent of run after all of these things. And to put my trust in my Heavenly Father Who knows what I need. Who feeds the birds and clothes the fields with flowers. I just need to seek His kingdom and the righteousness that He is calling me to.